Sergeant Hank the Tank made his bones on tour but that’s not what made him a legend. That would be his Key Lime Pie, a rendition inspired by his Grandma’s secret family recipe. Smooth & Creamy Filling with a generous dollop of Whipped Cream infused with tangy & sweet Key Limes, all resting on a delicious Vanilla Graham Cracker Crust. Freedom never tasted so good! Eric from Inman, Tyler from Knoxville & 30 others bought this item recently. The brand New Army Man by One Hit Wonder eLiquid features TruNic 2.0 Nicotine Salt & is getting ready to be released real soon. This new One Hit Wonder eliquid (Nicotine Salt) will last quite a bit longer without getting dark. You will also notice that it’s smoother and has a cleaner inhale. Being that it’s a Nic Salt eJuice it will absorb at a quicker rate into your bloodstream. With creamy layers of sweetened milk balanced with subtly tart key lime citrus, Army Man is ready to invade taste-buds around the world. This is the 8th Flavor in the “Man Series” and they are still going strong. Check out the other One Hit Wonder Flavors. This new Key Lime Pie eJuice is going to be mouthwatering. 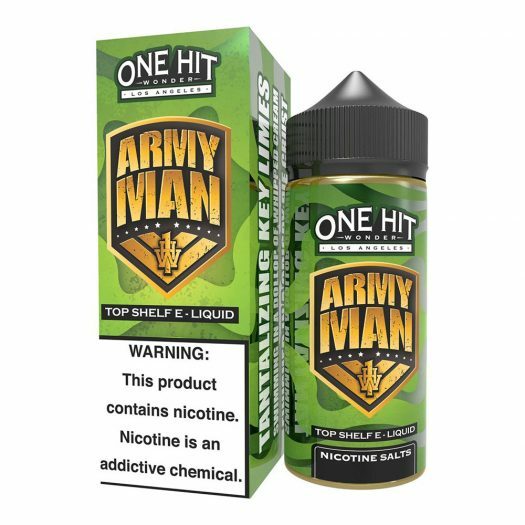 New Box & Bottle of Army Man 100mL Nicotine Salt make sure to get your Order in sooner rather than later. Great key lime pie flavor and 100 mls for less than 25 bucks you can’t go wrong. It is the most accurate key lime pie tasting vape i ever had. I love other brands of key lime pie but they are not as accurate with their descriptions. It does have a sweet cream flavor that some may think is too much but this juice is really good and if you like less cream then mix it with a lime or lemon vape and it will blow your socks off. Also $3.75 for 15 mls is a great thing to. I believe One hit wonder gave these 15 ml bottles out for free so the consumer could try it for less than 4 bucks. i have seen it for .99 cents. Great job on this one. This key lime is the best, last week i left my vape home while at work and a co-worker had this, i tried it and after work i threw all my other liquids out.